Martial arts puts kids on an early path to grow and succeed. 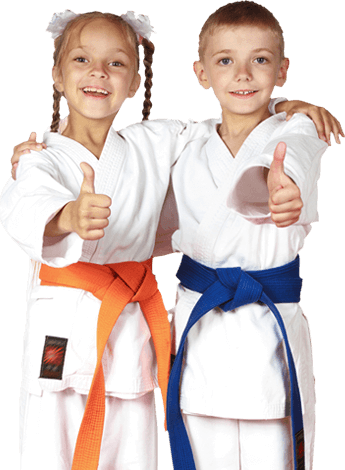 Our Kids Martial Arts program will help your child develop self-confidence, discipline, and respect for others at a young age. WHAT CAN MARTIAL ARTS DO FOR YOUR CHILD? Martial arts sometimes gets a bad rap. People often erroneously believe that it glorifies violence. They falsely associate it solely with Hollywood kicks and punches. While self-defense is an aspect of it, martial arts goes far beyond that. Not only does it help develop self-confidence and self-esteem, it also builds a sense of respect for others and encourages non-violent conflict resolution. Martial arts teach socialization skills to diffuse tense situations rather than actively engage in them. Learning martial arts can benefit anyone and everyone. Yet it is particularly beneficial for children, especially those that are working through their own difficult issues. Martial arts is a great way for your child to learn respect for others, to avoid being bullied, and to cope with stress and anxiety. All the while, they’ll be exercising with a group of soon-to-be friends, improving the health of their body and mind. Our martial arts classes foster respect in all senses of the word. Your children will learn not only to respect others, but to respect themselves as well. The lessons about respect your child learns through martial arts will mold them into a better person overall. Building confidence helps victims of bullying feel more confident about themselves. Self-confidence in itself is often a deterrent to bullying. For bullies, building confidence reduces the bully’s need to seek attention by bullying others. Learning discipline helps victims of bullying manage their behavior to prevent provoking others. For bullies, learning discipline encourages positive behaviors while discouraging negative ones. It provides clear cut rules for acceptable behavior. Learning about leadership helps victims of bullying make more friends, thereby reducing their chances of being bullied. For bullies, learning about leadership teaches them how to work others, recognizing how others feel in the process. Learning martial arts can benefit anyone and everyone. Yet it is particularly beneficial for children, especially those that are working through their own difficult issues. Mastering self-control helps victims of bullying recognize what behaviors cause a conflict to become worse and then prevent these. For bullies, mastering self-control promotes emotional awareness and teaches them how to control negative feelings. Victims of bullying experience extreme stress. If bullied at school, they’re often anxious to attend. Martial arts relieve stress, making your child feel less anxious and more at ease. For bullies, using martial arts to relieve stress helps lent out pent up energy and anger. It gives them a safe space to blow off steam. Of course, self-defense is a part of martial arts. But the process of learning these self-defense techniques is about building confidence. A victim of bullying that now knows they can protect themselves thanks to their martial arts training will appear much more confident. Much of the time, this confidence in itself prevents bullying. Our fun, exciting Beginner Dragons Program is designed for children just starting out. These action packed classes focus on the basics needed for a great foundation in the Martial Arts. Whether excited or energetic, nervous or shy new students are immersed with children who are, like them, just beginning. Grouping our beginners together calms their fears and encourages them to discover their new found talents. The Advanced Dragons Program is designed specifically for children who have mastered the basics. Advanced Dragons have the confidence to build on to their skills with more precise and intricate techniques as well as advanced aspects of our mixed martial arts program such as weaponry, sparring, grappling and much more. Our energetic Junior Dragon Program is created with our 'tween' and teen students in mind. These classes are grouped by age which uses positive peer motivation as a way of teaching our mixed martial arts program. Junior classes also address the issues facing this particular age group, such as self-confidence, positive self-image and self-defense. This is the easiest way you can try our martial arts classesl! Take advantage of one our web specials, it's as simple as entering your email and contact information and you will receiving your Trial Voucher via email. We can't wait to meet you or your child!